Enhance any wall space with vibrant colors that harken to warm days under welcoming sunshine amongst bright blooms in a garden or park. What’s more, all of the prints featured here are proudly made in the USA. Blooming flowers are a sure sign of warm weather. 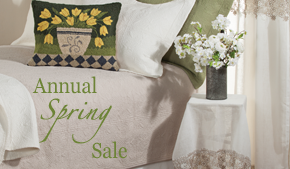 Spring brings with it bulbs and bright favorites like tulips and daffodils while summer shows us rapidly growing plants eager to spread their blooms across the yard. 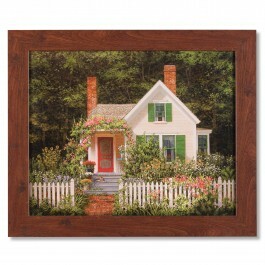 Old Roses Print shows us a cherished rose garden outside of a charming cottage. Imagine sitting here and enjoying a cup of tea with friends and family on warm sunny days, looking forward to bright blooms and sweet scents from season to season. Vermont artist Fred Swan uses his stunning ability to capture natural spaces to welcome us to this respite place. Large, usually red, barns are a favorite amongst country landscape painters as they offer a grounded location within the painting on which the rest of the scene is balanced. 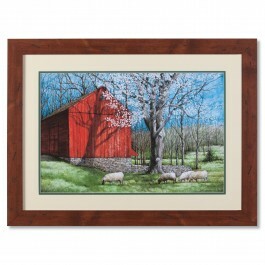 Here on Spring Red Barn Print artist Dan Campanelli shows us how tranquil bright days can be. Sheep graze amongst the shadows under the blooming tree while a bright blue sky welcomes us all to another day. Blue, red and green combine together with neutral tones to create a stunning statement on any wall of your home. Artist Billy Jacobs paints rural country scenes, especially in Eastern states where season variations and changes are watched by all including feathered friends. 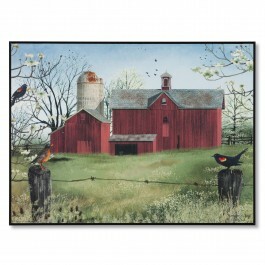 In Harbingers of Spring Wall Plaque, Blooming trees peek into the picture as red winged blackbirds and a robin perch amongst a barbed wire fence, searching for tasty treats amongst the grass and wildflowers. In the background we see a large red barn with an old silo, perhaps abandoned after all these years. Whether or not you are a gardener yourself, you can most likely appreciate the amount of time and effort that goes into maintaining flower beds, vegetable plots and herb plants. Chuck Pinson shows us his interpretation of a Sweet Garden, full of whimsical sights like horses, bunnies and birds all enjoying the smells and sights of this perfectly maintained space. Imagine that this is your very own special retreat into a land of vibrant color and peaceful landscapes, waiting for you until the next time you choose to enjoy all that it has to offer. 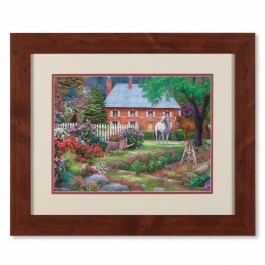 This entry was posted on Monday, March 10th, 2014 at 10:00 am	and is filed under Art, Made in the USA, Seasonal Decorating, Wall Decor. You can follow any responses to this entry through the RSS 2.0 feed. You can leave a response, or trackback from your own site.